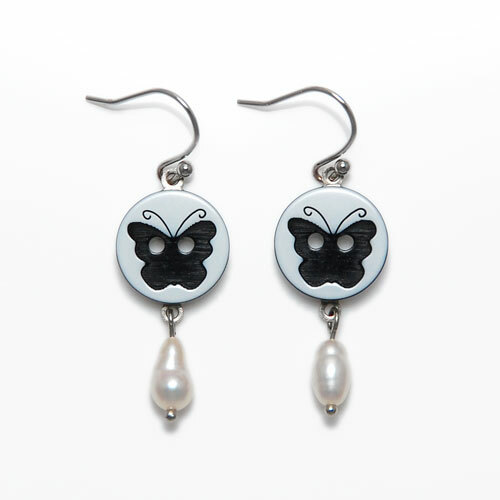 These earrings combine two of my favourite things - buttons and pearls! I felt inspired to make them after seeing a great exhibition last year called Pearls - Jewels from the Sea at the Hyogo Prefectural Museum of Art in Kobe. On display was an amazing variety of pearl jewellery and objects from all over the world - from tiaras worn by Queens to Marilyn Monroe's pearl strand necklace. It seems that pearls continue to be a timeless symbol of elegance. The exhibition explored the history of pearls in various cultures spanning a period of about 2000 years. It examined the historical, cultural and scientific background of the pearl trade and later cultivation. Japan too, has a long association with pearls with Kobe being one of the key places where they are exported. I also learnt about a Japanese scientist and entrepreneur, Kokichi Mikimoto who pioneered a technique to culture perfectly spherical pearls in 1893. I love that natural pearls are created by a happy accident - when a tiny particle gets trapped inside an oyster and becomes the beginnings of a new pearl. It was suprising to learn that natural pearls are actually quite rare and that each and every one is unique. Seeing the range of pearls on display at the exhibition (of pretty much any colour you could imagine) was really eye opening! Seeing the exhibition really got me thinking about using more pearls in the jewellery I make. Quite often, by using a pearl, you can add another layer to a piece of jewellery. So when I saw theses little butterfly buttons on a recent trip to Rollo, I thought they'd look good paired with some pearls! I think they're perfect size for everyday drop earrings and even though they're small, they stand out when you wear them. Sometimes (at least when it comes to earrings) simple is best! The buttons are new from Asia and are made of plastic in three layers - white, black and white. I think the design has been created by either cutting or etching away the butterfly shape from the top white layer so that the black shows through. I like how the design of the button is both simple and detailed. The contrasting black and white creates a stamp like effect. The pearls were originally from a bracelet that I took apart so are living a new life now as earrings! To make the earrings, I glued two metals plates to the back of each button so that I could hang the earring hooks from one side and pearls from the other. I'd like to try making another pair with black pearls next time! What kind of pearls do you like?